In Captain Tiago’s house, Father Salví paces nervously back and forth, not wanting to leave. María Clara and Sinang whisper, acknowledging that he is clearly in love. Ibarra then arrives dressed in mourning, and shots begin to ring out in the street. “Bandits! Bandits!” yell people outside as chaos takes hold of the town. Ibarra runs into the street and to the barracks, where guards have captured the rebels. He goes to the court, and the ensign declares that nobody is permitted to leave town that night. Ibarra makes haste to his home and goes into his study, where he puts his belongings in a pile to be burned. Before he can light this pile on fire, though, guards arrive and arrest him, and he goes with them without protest. Ibarra’s willingness to allow the guards to whisk him away without protest shows his understanding of the fact that there is very little a civilian can do in the face of the colonial government, even if that person is—like him—rich and influential. It also reflects his overall reluctance to ever resist authorities in an overt manner. After leaving Ibarra’s house in a fit, Elías ran to the forests and mountains, delirious and enraged. He saw visions of his grandfather and his sister’s ghost rising above the lake. Wading into the water now, he approaches his sister’s apparition. When he’s chest-deep, a large explosion yanks him from his revelries. Realizing suddenly that he’s in the lake, he runs to shore and back to San Diego. He goes to Ibarra’s house and burns the pile of papers and belongings that Ibarra himself didn’t have time to destroy. Just as he’s doing so, soldiers from the Civil Guard arrive to confiscate these items. Before they can do so, though, the house goes up in flames and Elías escapes out the window. Once again, Elías is something of a guardian angel to Ibarra. Given that he recently learned Ibarra’s great-grandfather caused his own family generations of pain, his loyalty to Ibarra is commendable. Ultimately, his devotion to Ibarra demonstrates that Elías understands the importance of casting aside all ideas of revenge, an idea Tasio has already depicted as a crucial mentality to adopt in times of oppression and crisis. This worldview suggests that a productive and conscientious citizen who wants to succeed in Filipino society must first and foremost act according to what he thinks will benefit his country. Lannamann, Taylor. "Noli Me Tangere Chapter 55: Catastrophe." LitCharts. LitCharts LLC, 9 Nov 2017. Web. 19 Apr 2019. Lannamann, Taylor. "Noli Me Tangere Chapter 55: Catastrophe." LitCharts LLC, November 9, 2017. 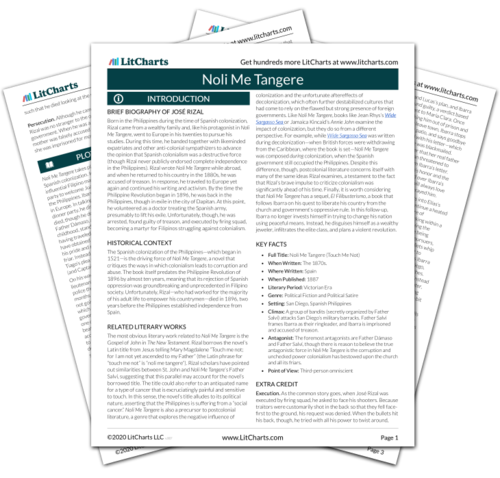 Retrieved April 19, 2019. https://www.litcharts.com/lit/noli-me-tangere/chapter-55-catastrophe.